It was such a rainy, rainy weekend here. One that makes you want to stay in and complete a project at home. I made the best of it because it gave me a chance to finally finish the my 2 year old Turning Twenty quilt. I had forgotten how big this quilt was! 82" long and 68" wide. DH had to stand on the couch and hang the quilt over the banister to get a decent photo of the quilt. You can see a little of the banister in the bottom right. Here's the finished quilt and a close up of the Moda binding. The binding has such a great tone on tone pattern to it. 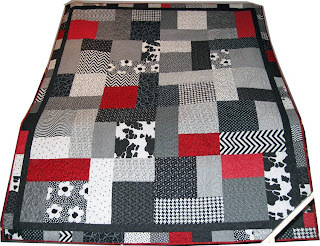 I popped on over from Nanci's blog "Quilting at the Cottage".